The Danish-German composer Søren Nils Eichberg (b. 1973) is the first composer in residence in the history of the Danish National Symphony Orchestra. This CD presents the premiere recordings of his Symphony No. 1, the large-scale doomsday vision “Stürzten wir uns ins Feuer” (2006), and of his Symphony No. 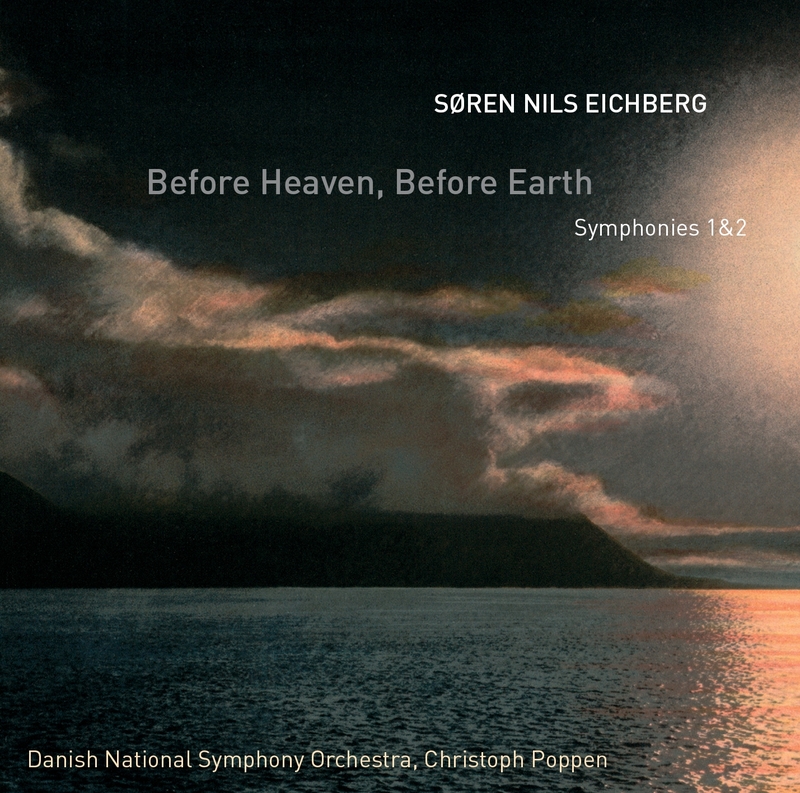 2 “Before Heaven, before Earth” (2010), that was first performed by the Danish National Symphony Orchestra and concludes an explosive phase of creativity in the young composer. "Urwüchsigen, bildkräftigen, tonal geerdeten Erzähllandschaften". Musikalische Wertung: 4. Technische Wertung: 5. Booklet: 3. "Det här är rasande bra musik." "Eichberg's music is immediately appealing, colorful, and irresistibly powerful." "Engineering at its best. A compelling disc for every bold-leaning lover of big-sounding symphonies." "A remarkable disc. It is impossible to remain indifferent to the music. The performances by the Danish National Symphony Orchestra under Christoph Poppen are ferociously good." "Eichberg hat wirklich etwas zu sagen und beherrscht die Klang-Klaviatur eines Orchester lustvoll-virtuos ." SELECT PREFERRED FORMAT TO DOWNLOAD SINGLE TRACKS. Chaotisch, aggressiv - 11:10 12,80 kr. Sehr genau - 3:46 6,40 kr. Gläsern - 3:30 6,40 kr. Wieder nervöser 5:02 9,60 kr. Schnell, wie im Rausch - 14:46 12,80 kr. Tempo I - 11:14 12,80 kr. Mysteriös - 5:10 9,60 kr. Tempo II 2:59 6,40 kr. ‘Composing's something I've always done,' Søren Nils Eichberg says disarmingly. He is trained as a pianist and has no official qualification to prove his capacity as a composer. The music has just come of its own accord. He has acquired the technique of composing for an orchestra in practice by studying conducting, and as a practising musician he works both as a pianist and a conductor. During the last few years, however, it is definitely composition that has gained the upper hand. Among his more recent compositions are a cello concerto, a piano concerto, a double concerto and a concerto grosso as well as several operas. Most recently, Covent Garden in London has commissioned a chamber opera from him. In 2010, Søren Nils Eichberg was the first person ever to be appointed composer in residence at DR SymfoniOrkestret. In the course of three seasons, the orchestra has presented a wide selection of his works, including a first performance of his Symphony No. 2 and Concerto for Orchestra. Søren Nils Eichberg was born in Stuttgart in 1973. He is of Danish-German parentage, grew up in Denmark, qualified as a pianist in Copenhagen and Cologne, and is at present based in Berlin. His breakthrough came in 2001, when the Greenland-inspired Qilaatersorneq for violin and orchestra gained first prize at the Queen Elisabeth Music Competition in Brussels. Since then, Eichberg's music has spread to many countries, for it has a spontaneous appeal to both musicians and listeners. Eichberg's Symphony No. 1 was first performed in 2006 by Odense Symphony Orchestra and must already be considered an ‘early work'. The vision immediately fascinated Eichberg when he read the book. But to place the quotation alongside Søren Nils Eichberg's Symphony No. 1 is also because he felt that it expressed something about the situation at the beginning of the 21st century. ‘Europe was once more conducting a war of aggression, and the political currents that sixty years previously had laid Europe in ruins were on the advance once again. In Denmark, they were even allowed to gain parliamentary influence. The Muhammad cartoons also appeared during that period,' Eichberg has explained. Symphony No. 2 from 2010 is the jewel in the crown of an entire work-complex that Søren Nils Eichberg had been working on since 2008. During a scholarship stay in Italy, so many ideas presented themselves that not even the three works he was composing at the time could make use of all of them. The material was used for the Double Concerto, for an opera and for an orchestral work commissioned by the German Ensemble Modern. And the material also lives on in his Symphony No. 2, concluding an explosive phase of creativity. One does not have to know the other three works to enjoy the symphony, Søren Nils Eichberg points out. The material that the works share also finds highly different forms of expression in the various works. In the piece for Ensemble Modern (‘In Circles'), the ideas seem to be restless, transient fancies, while in Symphony No. 2 they are used in a more carefully worked-out fashion. The symphony is once more an uninterrupted sequence. Despite this, it is constructed using a classical model during which one senses a ‘first movement' a ‘slow movement' and a ‘finale'. The whole work derives from two contrasting themes presented at the start. This introductory section is played twice - a symphonic ploy that goes right back to the infancy of the genre. The ‘double presentation' is particularly useful in music that listeners do not know in advance. The first theme of the symphony is a series of chords played by the violins and violas. The contrasting theme is a quick, rhythmic bass figure presented by the deeper strings. As an introduction to the whole piece one hears a series of figures in the strings that are repeated ad libitum. They reappear at the end of the symphony, but the course of the music has altered the material. While initially the expression was aggressive and chaotic, the symphony ends with a concluding ‘satiated' feel to it.